Rover luxury and Honda reliability. Talk about a great idea. This car was known as the Rover 800 in most of the world. In North America, where Rover had a less than stellar reputation due to past problems with their cars, they decided it to call it something else. The very British name Sterling was chosen. The US public took to the car initially and 14,000 cars found homes in the US in 1987. But, it wasn't long before traditional British problems (electrical gremlins, build quality issues) soon started appearing in these early cars and sales dropped dramatically. 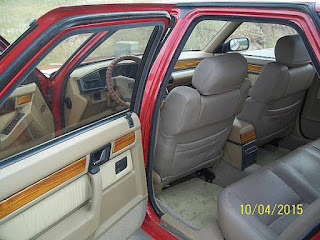 Initially, all Sterlings were four door sedans. They were powered by a 2.5 liter Honda V6. 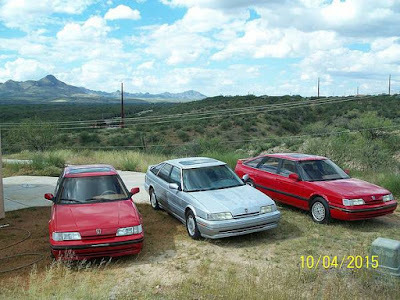 In 1989 the Sterling got the larger 2.7 Honda V6 and a 5 door fastback, like these cars, was introduced. Build quality also improved dramatically but, at this point, no one really cared. Less than 6000 Sterlings found homes in the US in 1989. In 1992 Rover announced that it would no longer sell the Sterling in the US. In my eyes, the 827SLi is a great looking car. Sleek and stately, it looks like a modernized SD1. The seller has owned these cars for 15 years. They appear to be in nice shape. He's asking $15K for all three. Thankfully, I don't have an extra $15,000.00 hanging around. If I did, these cars would be mine. 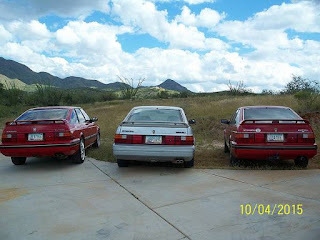 Located in Rio Rico, AZ, click here to see the Craigslist ad. Three Sterling 827's on sale together, that is something I was not expecting to see today. I hope the seller does find a car geek like us who would be willing to purchase 3 of the same vehicle at the same time. I got one as a trade in the late 90's; I recall the timing belt broke or something right after I got it and off to the junkyard it went. The Sterlings weren't worth much wholesale at the time; $1000 would buy a nice one.